With the first day of the trial over, Kokone-chan, Minuki and I left the courthouse. As I walked pondering these things, he appeared once again. Mitsurugi ignored my flippancy as he responded. A slight smile appeared at the corner of Mitsurugi's mouth as he spoke. Kokone-chan, Minuki and I all raised our voices at once. Minuki spoke, still taken aback. The three of us raised our voices again. Mitsurugi turned his back and walked away. Minuki tilted her head. Kokone-chan spoke up. I wonder what the connection between him and Uranashi-san is. A popular politician and the chief prosecutor... There's something fishy about this. We returned to the office to figure out our game plan. A large sheet of paper was laid out on my desk. Minuki had laid out some small figures that had come as a bonus with some candy on the paper. I arranged the figures as I spoke. Kokone-chan was lost in thought. Minuki offered a harsh opinion. Ugh... Even I think it's unlikely... But I didn't really have many cards to play at the time. I moved the figures located in the departure lobby. That point was made clear by Jinguuji-san's testimony. The waiting room is close to the hand luggage examination area. And the observation deck is just past there. Yeah. It'd be great if we could find the weapon with blood and poison on it... But Prosecutor Garyuu had told that the deck and tarmac had been thoroughly investigated. There were no signs of any weapon. Kokone-chan raised her hand with a shout. “Hmmm...” We all looked at each other as we thought. Then beep boop beep... an electronic sound rang out. It was my ringtone. I put my phone to my ear and a lively voice leapt from the other end. I was lost for words. I hadn't heard that voice in a while. Her voice is so laid back. Hearing her at such a tense moment helped put my nerves at ease. Mayoi-chan – Mayoi Ayasato, was once my assistant. Or rather, her official job title was ‘assistant', but she was so much more than that. When I was still just a novice attorney burning with the passion of youth, Mayoi-chan was always there to support me. Or rather she dragged me around with ridiculous energy and pushed me from behind when I needed it. Mayoi-chan and I resolved a lot of cases together. It's thanks to Mayoi-chan that I've made it to where I am today as a lawyer. More so than an assistant, I'd rather consider her the ultimate ‘partner'. 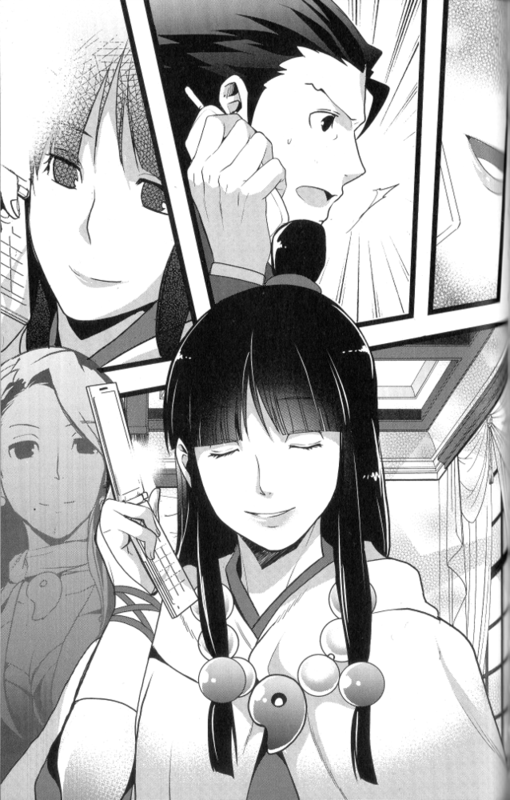 At the moment, Mayoi-chan has left Japan to train in a country called the Kingdom of Khura'in. You would never guess from her laid back attitude, but Mayoi-chan is a spirit medium with incredible power. In order to further improve her spiritual power, she has to train in the Kingdom of Khura'in. Minuki whispered “We're heading out for a bit.” and dragged Kokone-chan off by the arm. Kokone-chan nodded and said “See ya later.” as she left the room. It seems they wanted to leave me to take my phone call in private. I gave her an outline of the case. That the defendant was one of my employees and we'd reached the end of the first day up against ridiculous odds. My tone became darker as I spoke. I was aware of it, but I couldn't muster the energy to avoid it. Mayoi-chan's tone suddenly changed. I gripped my cell phone tightly. I was lost for words, I could simply just press the phone against my ear. That voice... it couldn't be... Chihiro-san...? Mayoi-chan had an older sister. A lawyer named Chihiro Ayasato. Chihiro-san was my mentor back when I had just become a lawyer. For many generations, the Ayasato family have been a clan of powerful spirit mediums. Which means that Mayoi-chan must have called her sister's spirit to tell me that. The summoned spirit of Chihiro-san has given me all kinds of useful advice in the past. Her words have always supported me when I hit rock bottom. The voice on the other end of the line suddenly changed. The laughter was clearly Mayoi-chan, not Chihiro-san. Surprised doesn't cover it. The shock had hit me like a punch. The worst of times are when a lawyer has to force their biggest smiles. That is the single greatest piece of wisdom Chihiro-san imparted to me. It's helped me out whenever my heart stops or I'm frustrated with no clear path ahead, yet it had slipped my mind. Today in court, I'd been furrowing my brow during the rough times when I should have been smiling. It's odd, but hearing Mayoi-chan's carefree tone made me feel like things really would work out fine. The call ended. I raised my head, the clouds in my heart have cleared. I'll be fine. No matter how bad it gets, I'll keep on smiling. I'll keep the attorney's spirit I inherited from Chihiro Ayasato alive.